When BFFs Charlie, Taylor and Jamie go to SupaCon, they know its going to be a blast. What they don’t expect is for it to change their lives forever. Charlie likes to stand out. SupaCon is her chance to show fans shes over her public breakup with co-star, Reese Ryan. When Alyssa Huntington arrives as a surprise guest, it seems Charlies long-time crush on her isn’t as one-sided as she thought. Taylor likes to blend in. Her brain is wired differently, making her fear change. And there’s one thing in her life she knows will never change: her friendship with Jamie, no matter how much she may secretly want it to. But when she hears about the Queen Firestone SupaFan Contest, she starts to rethink her rules on playing it safe. I loved Queens of Geek. I read the whole thing in an afternoon and I’ll be shoving it into the hands of friends as soon as I’ve finished writing this review. The book is written in first person, alternating between the perspectives of Charlie and Taylor, the two main characters. Charlie is a rising star with a popular YouTube vlog. She also recently starred in an indie movie that was a hit with audiences. She’s very much in the public eye and she’s come to SupaCon at the behest of the film studio to promote the movie and the sequel. However, neither she nor her agent have much influence in the industry and so even though Charlie’s friends have come along for moral support, they’re unable to get VIP passes and are separated from Charlie early on in the story. This gives space for Taylor’s side of the story to develop. Taylor is an Aspie with social anxiety. Coming all the way to America for a big convention is a huge step outside her comfort zone. But she’s determined to meet her favourite movie star, and her best friend Jamie is there looking out for her. I loved the relationship between these two. It’s clear from the start that Jamie cares about Taylor by all the small things he does to ease her way and to check on her. When she inevitably has a meltdown, he never pushes, but gives her the space she needs, often without her even having to ask for it. I also loved that he is as much of a geek as she is. They talk in movie quotes and his own interest in comics is present alongside her love for fandom. It was refreshing to see a relationship portrayed between geeks instead of between a geek and an outsider or from an outsider’s perspective of geekdom. The book touches on a lot of different issues. While Taylor is negotiating the challenges presented by her social anxiety, Charlie is dealing with sexism in the entertainment industry and the division (or lack of it) between her public and private lives. And the story also touches on bisexual erasure, when Charlie’s ex declares he doesn’t believe bisexuals exist. The presentation and resolution of these issues isn’t always the most subtle; like most fangirls, this book wears its heart on its sleeve. It also constantly shows examples of women supporting each other. Even when things are falling apart for Charlie, she’s always there for Taylor’s big moments or whenever Taylor needs a friend. Likewise, even when Taylor is competing against other women, it never stops her from holding out a hand in friendship–especially when its needed. And this support is also demonstrated over and over again by minor characters. 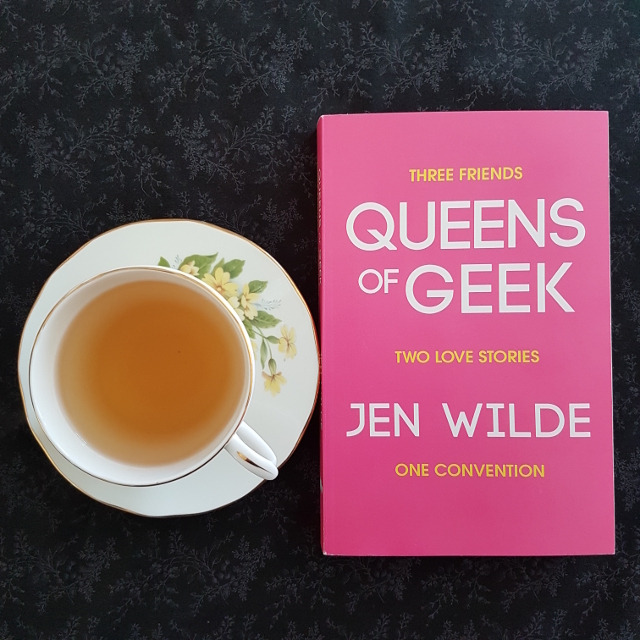 Queens of Geek made me so happy and I’d love to see more stories like it.